Yesterday was National Ice Cream Day. Ronald Reagen signed a bill in 1984 designating the third Sunday of July a day to indulge in this heavenly treat. Well, I ate all the Ben & Jerry's I bought before the 4th. Yesterday was hot and muggy so I didn't want to go out to get any ice cream. So, I decided to celebrate today. After being out in the field and getting rather dirty and forgetting where I put my work boots this morning and nearly panicking and then walking into several fires that needed to be put out, I felt a swing by Dairy Queen on my way home was justified. It's also the 25th year of the Blizzard. What an amazing coincidence! National Ice Cream Day AND Blizzard's birthday. 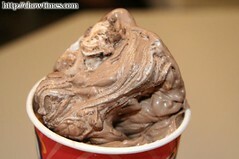 Now, it can be argued that soft serve is really NOT ice cream. I know I have heard, and probably made, that argument over the years. But it was a left turn into and out of Oberweise's store to get iced cream whereas it was a right turn into and out of Dairy Queen. When you're tired and you want to go home, what are you going to do? I got a large French Silk Pie Blizzard. She gave me a senior discount. I almost laughed out loud. But that discount turned out to be enough that I didn't have to break my $20. There's something to be said for gray hair. So, here's to National Ice Cream Day a day late. I took care of my chocolate craving for the week, too.